Although Southern Accents is an architectural antique and salvage company, we are also a team of artists, creators, designers, visionaries, builders and collaborators. As such, we revel in an opportunity to meet and collaborate with fellow creatives. One recent meeting was with an impressive artist originally from Florence, Alabama; Matthew Mayes. Matthew is a self taught artist with 12 years experience in the professional art field. Matthew began his artistic adventure as a child watching the “Joy Of Painting” with Bob Ross. Having experienced many stints in the hospital and schooling at home because of illness, Matthew needed an outlet for his creativity. He credits art as filling this need in his life. A gift it is! Matthew’s artwork is inspirational. Southern Accents is currently housing one of Matthew’s works of art titled “A Sense Of Peace”. 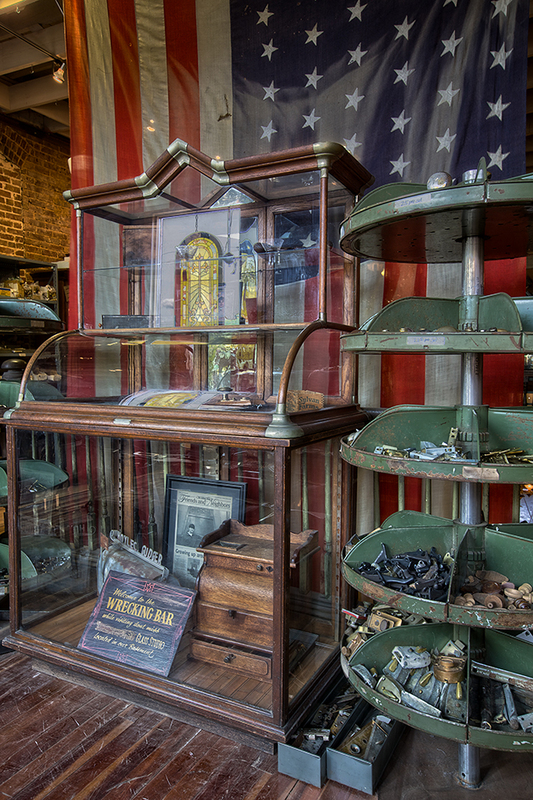 This 30″ x 80″ work, which is available for purchase, can be viewed in our showroom in downtown Cullman. Matthew’s artwork is also on display now through September 4th at the Birmingham Public Library. Visit the central library’s 4th floor gallery to view works from his “Layers of Meaning” collection. Visit Matthew online at matthewmayes.net to view as well as purchase his beautiful artwork. Matthew is also available for commissioned works. Sloss Music & Arts Festival – Tent Transformation! The Southern Accents Team was hard at work last week in preparation for our latest BIG adventure! Garden & Gun Magazine contacted Mason & Dixon and SA and asked us to design/build an Artist Lounge and portrait studio for last weekend’s Sloss Music & Arts Festival in Birmingham, Alabama. We worked to transform a large event tent into a very cool, yet functional, relaxing lounge for the artists. With each new project our goal is to turn our creativity up a notch. We did a little research and came up with something unique for this festival! Shou-sugi-ban is a Japanese term that means “burnt cedar board.” The term is commonly used to describe a centuries old Japanese technique of charring wood planks for use as siding. While this method of wood treatment was originally used to make the wood less susceptible to rotting and insects, today it is more often used for aesthetic purposes. We thought the charred wood would pair perfectly with our painted white, 10 foot tall salvaged Gothic windows, vintage fireplace mantels and decorative 10 foot tall copper mirror. The lounge, which was equipped with charging stations, had an “old southern church” feel to it. The interior of the tent housed our salvaged wood farm tables and two large bars reminiscent of the ones that once graced the old general stores. 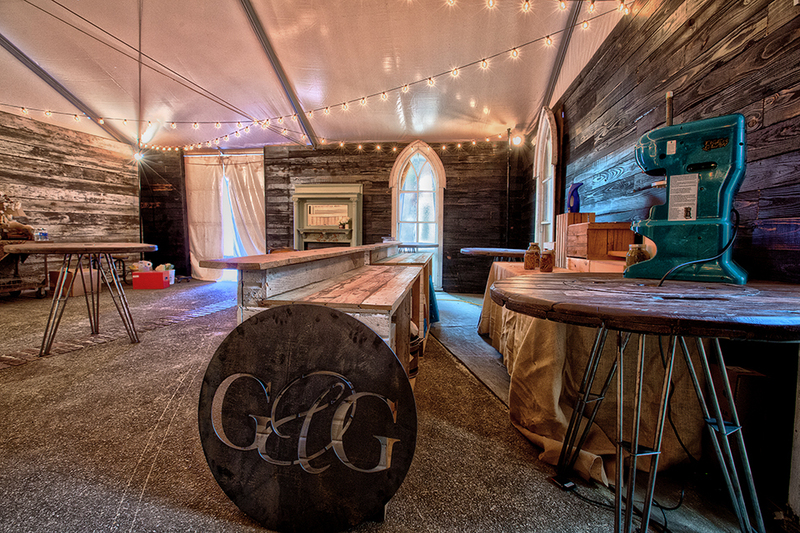 In addition to the artist lounge, Southern Accents constructed a faux studio for Garden & Gun, which was used for artist photography sessions throughout the event. A Vanity Fair photographer was on site to capture candid shots as well. The two day festival at the historic Sloss Furnaces in Birmingham, Alabama, featured three music stages and included an incredible lineup of over 30 bands and musical artists including The Avett Brothers, Modest Mouse, Band of Horses, St. Paul & The Broken Bones and many more. Attendees enjoyed Nick ‘N Friends BBQ Experience, Iron Pouring, API Poster Show, Piggly Wiggly Craftly Beerly Tent, Regional Art and Food Vendors and more. We hope you were following our social media accounts for updates throughout the weekend! Here’s a few pictures that show the incredible tent transformation! 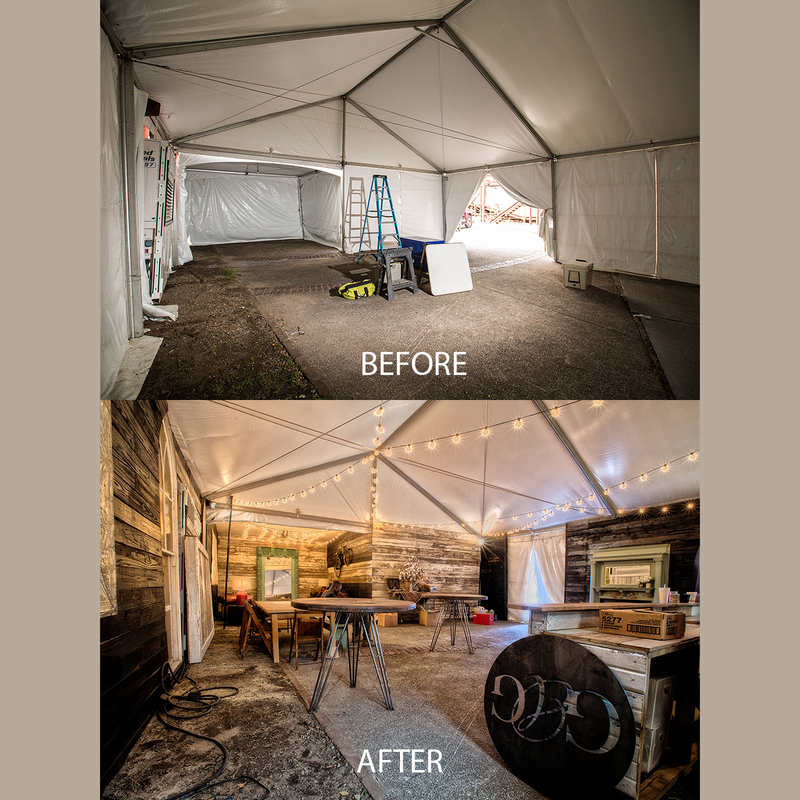 This picture shows a before and after shot of the large event tent. The after picture was taken late Friday. A few finishing touches were added the next morning to the air conditioned tent and the lounge was ready to host all the guest artists, providing a welcome refuge from the summer heat! 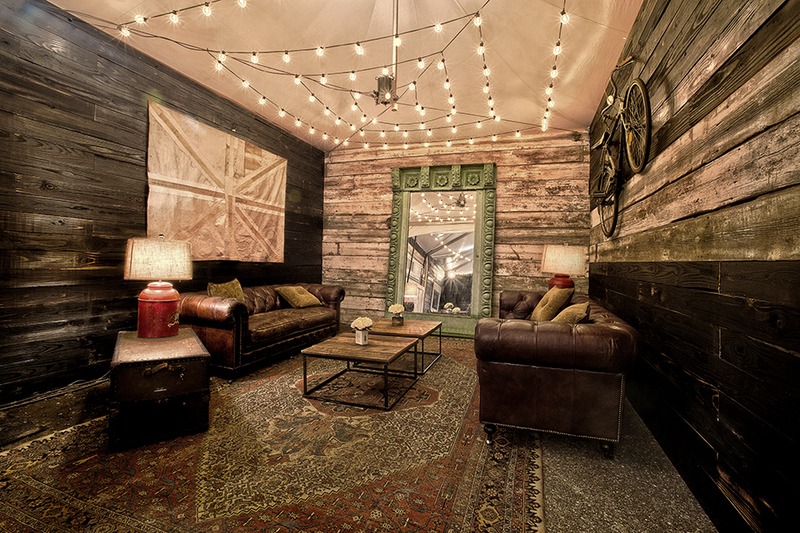 Southern Accents was honored to have been given the opportunity to design/build the artist lounge for Garden and Gun. 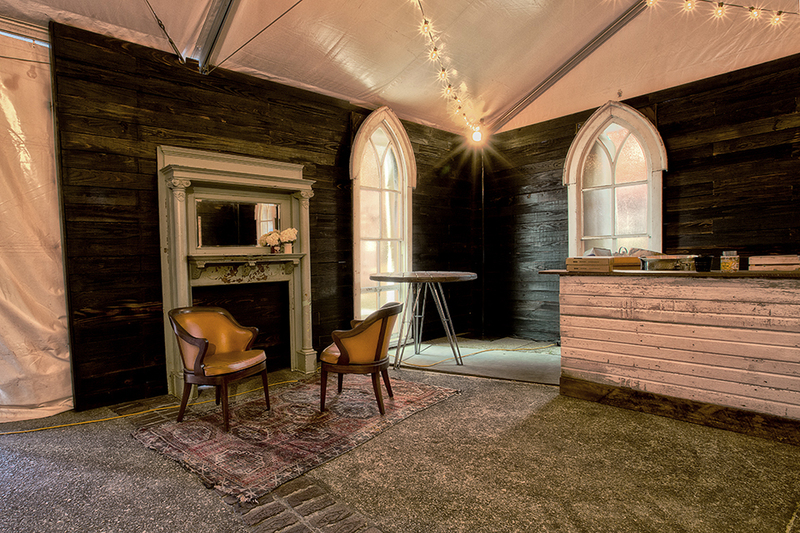 The salvaged wood walls completely disguised and transformed the white event tent, turning it into an inviting living area. The white cathedral windows looked incredible set against the black charred wood walls. Zippers in the side panels of the tent allowed us to let in some natural light through the windows but still keep the tent cool via use of a large air conditioner. We would like to thank everyone who was involved with this project: Mason Dixon, Garden & Gun Magazine, Ivory Exchange Rentals, Mary Clayton Carl, Cullman Sign and Banner, Red Mountain Entertainment, Shin Dig Catering, JAH Woodworks, Pepper Place Pop Up, Lisa Jones Photography, Sully Sullivan, and the incredible, amazing, talented, hard working, Southern Accents Team!! It takes a village!! There were many throughout the week who stepped in to lend a hand. If we have failed to mention you specifically, please accept our apologies but know that no act went unnoticed! THANK YOU!! 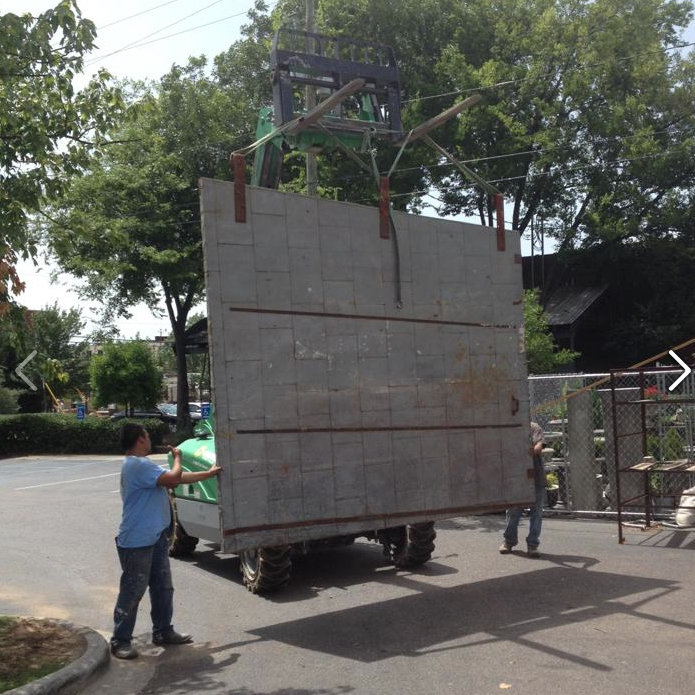 Last week, Southern Accents delivered a huge salvaged steel fire door to Birmingham, Alabama. This particular door will be used in a new restaurant preparing to open in the Pepper Place Market. Pocket, or sliding doors, have become extremely popular for both residential and commercial use. While one typically thinks of pocket doors being used for pantries or bathrooms, “exterior” sliding doors, or barn doors, provide a great solution for covering almost any existing opening. Not only do these doors provide a practical option, but they can become an integral part of a rooms decor. Many of our customers, when looking for a pocket or sliding door, are surprised when we tell them that many regular doors can be used as a sliding door. The only difference in a sliding door and regular swinging door is a simple change in hardware. When looking for a suitable door you need to make sure that one side of the door will slide flush against the wall. The door also needs to be at least 2 inches wider on each side and 3 to 4 inches taller than the opening to ensure that it is fully covered and will not show any daylight creeping out the edges. 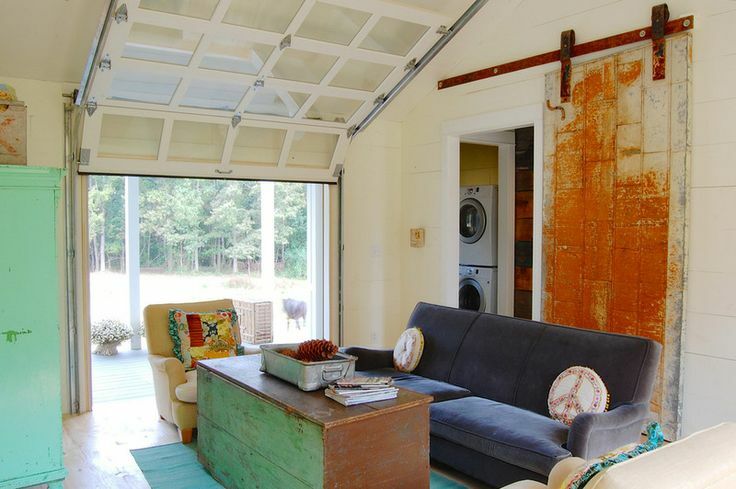 This metal fire door, originally from Chicago, was purchased from Southern Accents and is one of many sliding doors used in the renovation of this house in Horton, Alabama. While we do occasionally have salvaged tracks available for the sliding doors, we recommend purchasing the tracks from a hardware store. Locally, the slider tracks can be purchased from Tractor Supply. 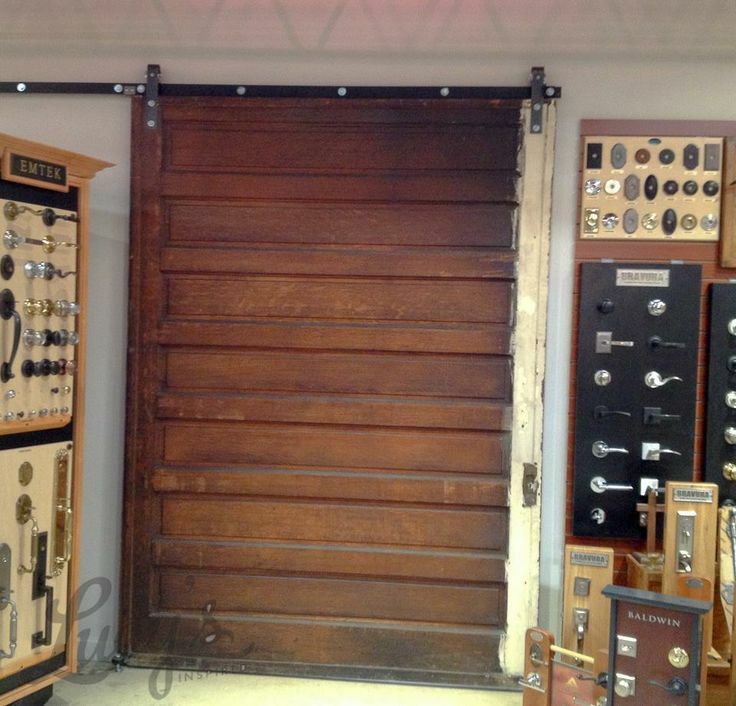 You can also purchase the tracks, also referred to as barn door hardware, online from companies like Rustica Hardware. When searching for the perfect sliding door, one other option to consider is a custom made door. Our in house wood shop allows us the ability to custom make your door to any size specification! Choose your wood from our showroom of salvaged and reclaimed wood. We can even assist you with the design of your new door. Stop by our showroom or give us a call at 877 737-0554 and request an appointment with Garlan or Ben and let us help you design your new door! 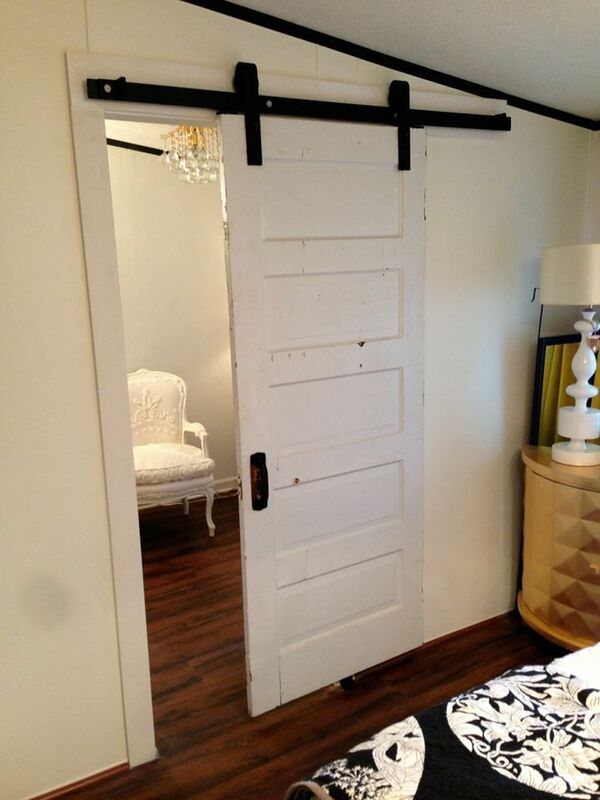 This salvaged door from Southern Accents was converted to a sliding door and installed in a bedroom. Visit Southern Accents and you will find that we have over 45,000 square feet filled with architectural antiques and salvaged goods ready and waiting for a new home. Scattered among the many treasures that are available for purchase are a few that we’ve kept for ourselves. These items are near and dear to our heart, none more so than our giant American flag. The flag, which measures 8′ x 12′, hangs above our large staircase and is one of the first things you will see when entering our showroom. We our proud of our heritage and proudly display our American flag. It is a daily, visible reminder for us of the many freedoms that we enjoy. It is also a reminder of the many sacrifices that have been made. This weekend we will be celebrating those freedoms. As we gather with family and friends, we will stop and give thanks for the many ways we have been blessed. We will also remember those who have given their all over the past 239 years to ensure the freedoms that we continue to enjoy. We hope that everyone had a Happy Independence Day! God bless America!